I have a garden. It is not the best garden, but it is mine. Contrary to the belief of my neighbors, I am not actually striving to have the biggest and best garden in the world, just a good one. My garden is not just for growing food. Whenever I dedicate time, money, and effort to anything in my life, I need to justify it. I don’t have much time, and I have even less money. So how can I justify dedicating my entire front yard to a garden? I believe I have ten legitimate reasons for my garden lifestyle. 1. To glorify God – Glorifying God is my chief end (WSC Q. 1). “Whether we eat or we drink, we do it all to the glory of God” (I Corinthians 10:31). The first context God placed man in was a garden. I will resist a full sermon on that, but simply to say that it is quite natural and fitting for man to be in a garden. There is no direct command in Scripture requiring each person to have a garden, but I believe there are many benefits to being part of the process of cultivating food from the ground. First, we get to witness, participate in and marvel at a God-designed process of life. If you ever wanted to be a part of something “cultural,” cultivating land and food is the oldest cultural experience. Exercise your dominion! Secondly, we see first hand how our daily bread really does come from the Lord in the natural world he created. Supermarkets and food courts have blocked our vision of where food comes from. I knew a 10-yr-old boy who thought the ears of corn were pulled from the ground like carrots. Thirdly, having a garden helps us hear Jesus’ parables with better clarity. Rather than having a preacher explain to us the various horticultural and agricultural particulars, we could simply know what Jesus meant like His initial audience. We would know first-hand the particulars of the Parable of the Good Soil. Perhaps we would reflect on that parable and others while we were pulling our weeds and pruning our grapevines. 2. To grow food – Currently my garden does not produce enough food for my family to live on, but I am working on it. With hard work and dedication, we can produce tons of food per year on a quarter-acre lot. I invite to you check out the Dervaes family to see what they do with less than than a quarter acre. I am not particularly concerned about GMO’s (genetically modified O’s), but I prefer to eat food that is cultivated for taste rather than visual appeal for grocery store display. I have eaten one-too-many tasteless (and sour) plum-sized grapes. I also prefer not to eat food that was sprayed with poison. The FDA and I disagree with the definition of “safe.” Who likes pealing of the little sticker of an apple anyway? 3. To send a message to the food companies, governments, and anyone else who wants to limit my right to enjoy God’s green earth and feed my family – My thoughts on our current food industry are as vast as the current food industry, but for now, let me affirm that I am a capitalist who believes that everyone should have food. I believe in making food for money and selling at whatever rate you want. But something bad happens when the food companies are in bed with the government, creating an over-regulated industry in which smaller farmers cannot compete. For more on all of that check out Joel Salatin’s book Everything I Want To Do Is Illegal. Capitalistic farming is good, but after you inject it with the dual hormone of American grown greed and pragmatism supplemented with government regulations that altogether create immunity against small farmers, you end up with a monstrous and dangerous food industry that is nearly impossible to reform. I am not an alarmist, but it makes no sense that people have no food in tough economic times (or any other times), when all you need is right under your feet as soon as you step out of your front door. We have been groomed to think that food must come from somewhere else requiring big machines and generations of farming experience. Let’s think outside the frozen food box. Just to be sure, I don’t think it is a moral imperative that everyone should have a garden. I understand that many people are free to choose to invest their time doing other things. Enjoy. Just don’t complain if there is no food in the fridge as you watch TV. “But I live in an apartment,” some will say, “I don’t have a yard.” Then resort to using pots or find or create a community garden. Perhaps condo and apartment developers will start incorporating garden space next to the community pool if there was a demand for it. If you live in one of those prefabricated developed neighborhood with an HOA, your options are severely limited. Either work on revising the covenant laws or work on moving. 4. To get rid of my lawn – I have never enjoyed mowing a yard. Maybe you do. I don’t. How much money do we spend on them? How much time and money wasted going to the gas station, buying the weed and seed stuff, yanking on that pull-chord on the lawn mower, for what? An over-sized welcome mat? A green monster that gobbles up my time and money? You can have it. I’ll keep my green monster in left field at Fenway. Go Boston! 5. To get the kids outside – To get the kids outside! 6. To get mom and dad outside – There are mental/emotional and physical benefits to being outside working a garden. Mental benefits are immediately felt after a drive home in rush hour traffic after a long day at work. Killing garden pests never felt so rewarding. The physical benefits are obvious. You get your daily source of vitamin D from the sun; your get some exercise from moving around, bending down, picking up, and pulling weeds, not to mention eating healthy food is always good for you. Would it be a stretch to say that taking time early in the morning and praying while in the garden has spiritual benefits? Jesus prayed in the garden. Enough said. 7. To create family unity – Working on a garden with each family member taking responsibility for a particular task demands team work. For instance, my daughter has rabbits in the back yard. Since she will not allow me to eat them, those bunnies must produce something for me in order to justify their existence. Their rent is offered in the form of little round morsels of fertilizer. My daughter’s job is to make sure those offerings are taken from the back yard and placed in the garden in the front yard. 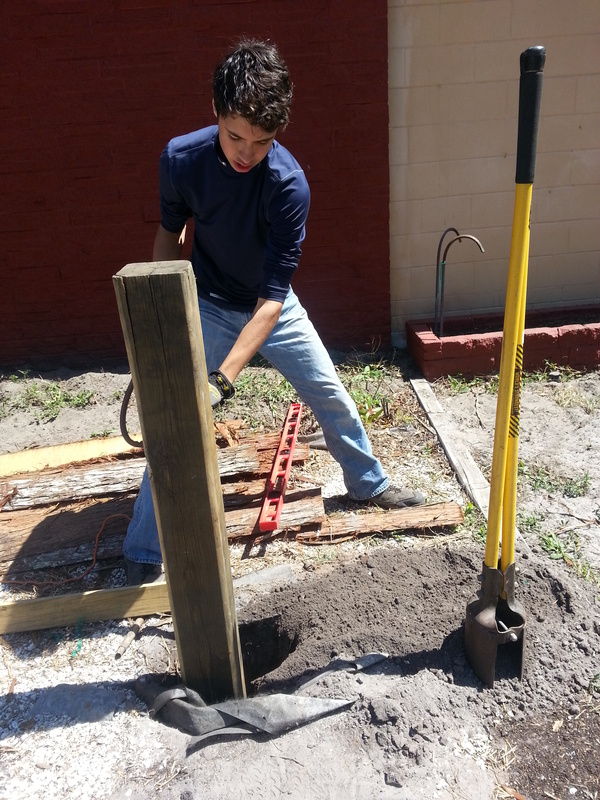 Currently we are working on a new fence. Each member of the family has a hand in the construction of it. Building the fence ourselves saved money rather than buying it prefabricated from one of the home improvement stores. 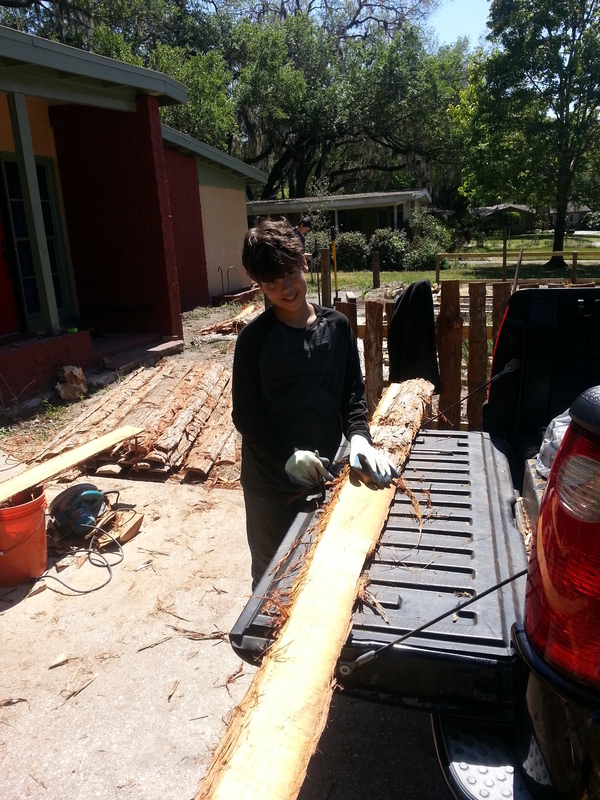 I found a local lumber yard, and we used the first cuts of cypress logs (I know, there are conservation issues concerning cypress trees). Rather than have the pros install it for us, we did it ourselves reinforcing our dependence on each other as we work as a team. Unity is again reinforced when we sit down to eat at dinner time eating the fruit of our labors. Each cucumber and green bean has a memory of us working together behind it. 8. To save money – It pains me to buy zucchini in the store (not matter how inexpensive) knowing that it could have grown in my yard. I will admit that it takes money to buy the tools, seeds, garden bed material, and fencing, etc. But in the end, real money could be saved by growing your own food. But even IF I could never get to that point, the first seven reasons are enough to justify spending the time and money. Buying tomatoes in the store doesn’t help my children understand important life principles. 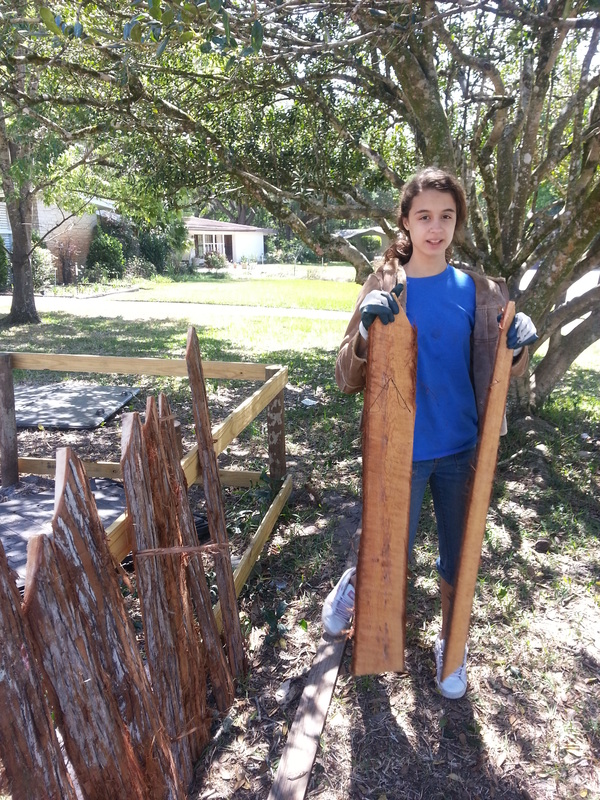 Buying green beans at the corner fruit stand never would have provided me the opportunity to teach my children how to build a fence. 9. To help me understand life and ministry – Jesus used agricultural knowledge to springboard into His parables. The reason He did that is quite simple. The Lord of all creation has built-in principles that apply to the natural order of things as well as the spiritual realm. When I survey the progress of my garden, I try to take those observations and apply them to my life in general and my various ministerial responsibilities at church. When I see a suffering plant not bearing fruit, I assess that it is suffering from poor soil, not enough water or sunlight. I take that observation and ask questions about areas of my own life. Are there areas in my own life that need more fortification? Am I spending too much time and energy on something that is taking me away from other things, e.g., should I be preparing for my Hebrew exegesis paper right now or writing a blog about my gardening fascination? Was something planted too early before proper structures were in place to bear the fruit? Do I, personally, have time to water it all by hand or is there some sort of irrigation system that can be delegated to handle the task? These are my nine reasons to justify my garden. I will let you think of the tenth. One more thing since some folks have asked… Why devote the entire front yard to a garden? The answer is not too complicated – just three reasons. As I mentioned above, I don’t care for lawns; get ride of the grass – all of it. Also, the front yard is where the sun is. I have a pretty shady back yard. The size is the other question. Why so big? My garden is approximately 30′ x 40′ with another section on the other side of the driveway, which is 10′ x 30′. Small hobby gardens take time and the payout is not worth it to me. I have resolved that if we are going to do a garden, then let’s do a garden. I am not interested in a little token patch of space for a few maters and cukes. I can’t put all my hopes for fruit into a few plants that may not produce. I need to reap a harvest, not just grow some stuff for fun. This entry was posted on Thursday, April 25th, 2013 at 8:09 am	and tagged with agriculture, culture, Dervaes, dominion, Everything I Want to Do is Illegal, family, fences, food, Food industry, fruit, garden, God, grapevines, I Corinthians 10:31, Joel Salatin, lifestyle, nature, One Trowel Revolution, soil and posted in Christian Living, Gardens, God, Traditions. You can follow any responses to this entry through the RSS 2.0 feed.